If your mini bus has been involved in an accident of any nature, you’re going to need to ensure it goes to the best workshop for bus repairs. Getting the right work will mean that the bus is safe and fit for the road again, and also that it is presentable for company use. If you’re using a bus for private event shuttle services, paratransit services, service in the hotel industry, or even for school or club shuttle services, then having the bus appear in top condition will be hugely important. If you want to get the best repairs in Florida, then it’s time to talk to the team at Atlantic Bus Sales. Not only are we a leading national bus sales and leasing company, but we can provide the best service, maintenance, and repairs for busses of all classes. If your bus has been involved in a serious crash, then it will be fairly evident that you need to book emergency bus or van repairs at your earliest convenience. However, even if your bus has been in a minor accident where the damage appears to be mostly superficial, you’ll still need to make sure that you get it into our mini bus repair shop, as soon as possible. The reason for this is that your bus could have suffered from serious damage that is not visible to the untrained eye. Damage to the engine or cooling system, structural damage, or even damage to hydraulic systems, could all lead to a disastrous accident in the future. The problem is that most operators won’t know when a problem has developed, which is why it is important to schedule an inspection before the bus is used again, no matter how serious the accident was. If you are aware of minor problems and still operate your bus, you could be exposing your company to the risk of liability should your bus cause any on-road incident. In the case of harm caused to passengers, or even death, then this scenario would be both tragic and financially devastating. Nobody would want to cause harm intentionally, so it is important that you understand why it is so important to arrange your bus repairs, no matter how serious you see the scale of the damage or the accident that has occurred. Our qualified mechanics can provide a comprehensive safety inspection of your vehicle, and recommend the most appropriate repairs using original manufacturer or third party parts. It’s true that there are a number of repair shops where you could take your bus in Florida, but none of them would be able to provide you with the same service that you can get at Atlantic Bus Sales. Our talented teams know buses and large vehicles, inside and out. They can easily spot existing problems and ones that are only just developing. Because they have such vast experience in mini bus repair and maintenance, they’ll be able to recommend the most cost effective work, while always keeping the safety and integrity of the bus as the highest priority. Another reason why you should choose Atlantic Bus Sales, is because we can provide full body services. If your bus has been heavily customized, then it may be difficult to find the right parts and service at the average auto body repair shop. We will not only repair custom buses, but we have access to custom parts and can have body panels fabricated for your unique bus. Even if you have a specialist wheelchair lift or drop suspension system, you’ll find that we’re able to provide bus repairs in any situation. As a one stop repair shop, we’ll be able to consolidate all of your billing and you’ll only need to deal with a single trusted service provider. That will mean easier accounting and only one point of contact should you need any remedial work. Simply put, there is no better option in the Pompano Beach area. If you’re leasing your bus from us, then you’ll be able to take advantage of our expertise and familiarity with your vehicle. Just as we provide regular maintenance and service for your bus, we’ll be able to provide emergency mechanical, electrical, and body repairs in the case that your bus has been involved in an accident. No matter what the circumstances are, talk to us today for your mini bus repairs in Florida. 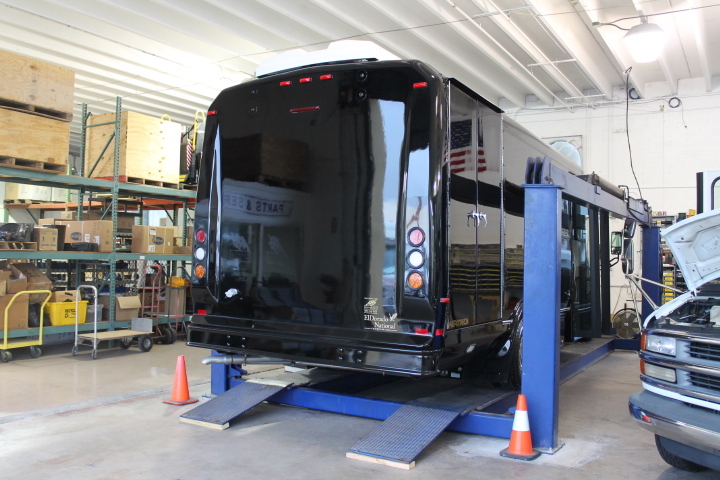 Leading customer service and the highest quality repairs mean that we can get your bus back on the road, in the best condition with full DOT compliance.